Arya Stark: Are you sure you want to do this? Sansa Stark: It’s not what I want. It’s what honor demands. Arya Stark: And what does honor demand? Sansa Stark: That I defend my family from those who would harm us. That I defend the North from those who would betray us. Arya Stark: All right, then. Get on with it. Sansa Stark: You stand accused of murder. You stand accused of treason. 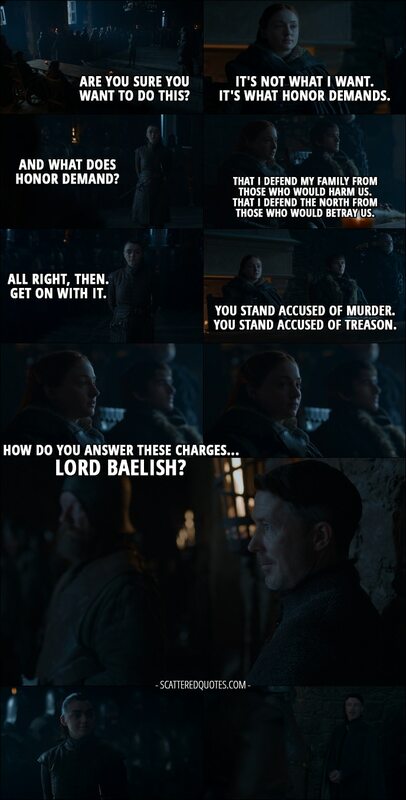 How do you answer these charges… Lord Baelish? 29.8.2017 How do you answer these charges… Lord Baelish?